It’s personal. Meeting in a client’s home. Extensive dinners after meetings falling into the non-billable hours category. Basically, you’ve become a friend. Except you’re not. You’re there for the business. Overdependance. You know you should continue marketing yourself. Go to those lunches, have those new business cards printed, perhaps a speaking engagement. Work on your website. Don’t fall into the trap of relying on this client for your primary billings and neglect ongoing marketing & sales of your business. The client becoming totally dependent on you is another major pit fall. Being needed is great. Being the savior of your client’s business or the center of their attentions perpetually is a recipe for disappointment and disaster. Nights & Weekends. Do you find the client wants your personal time as their own? Dinners with friends and family are missed for a two hour long client call. The client calls and expects you to drop everything on a Sunday night to address a minor concern. Don’t do it. E-mail is great. The occasional mishap or deadline is fine but habitual time bleeding shows a lack of respect for your time and will translate into billing issues or boundary push back down the line. The Flip Flopper. You’ve submitted the bid in writing. You’ve got the signatures, the budget, the time line. Now you’ve delivered a website, design or product that you know is good. After all, you’re a trained professional. At the last minute, after approving drafts and prototypes they want a radical redesign or major changes. Just remember: Specify the number of revisions included from the beginning. After that bill for your time and revisions. Making a client happy is important, unless it siphons off resources costing you frustration, lost productivity or takes away from other clients. Only Deals With the Boss. It’s important to have an individual or team accountable on a project. If you have a client that only wants to deal with you, as the owner/boss and no one else, even the folks doing the actual work, this is a problem. You’ve got to run the business. Dealing with a minutiae of trivial details best handled by the day-to-day operations staff wastes your time and is primarily an ego feeder for the client. If you have staff that lack the expertise to address the client’s needs, this is an internal problem you should address. It happens. Walmart Prices, Nordstrom Service. The client that wants undivided attention for a discount price. If you have a high maintenance client, charge for premium service. I happily give my time to my clients. I love the work and find I mesh with them very well. If I find a client is particularly difficult, indecisive or wants to debate every nuance, I simply factor this into our hourly rate. I have been known to included an “awesome guy,” or a “small business discount,” because it is such a pleasure to do business with these clients. First things first. Realize any part you may have played in creating unrealistic expectations for the client. You took the client out to dinner to cement the sale and talk business. Now it’s a ritual. You wanted to make the client happy so you worked double time. You only had that one client but now, you’ve got more work. Invoice Diligently. It’s amazing how associating a number with those countless tiny revisions can separate the perfectionist from the pragmatist. Submit a Close Out Report. This can concrete the project or client as in the closing stages while summarizing the work that is completed and making recommendations going forward. Don’t Wait Until You’re Angry. At the end of the day, some clients behave badly. Sometimes you have a bad day or a project stakeholder makes a mistake. Cryptic emails may create discomfort and uncertainty. Sometimes it’s easier to avoid or be avoided than to address a simple matter simply. The frustration will build and it will come to a head. Believe Your Gut. We all make compromises to make a living. 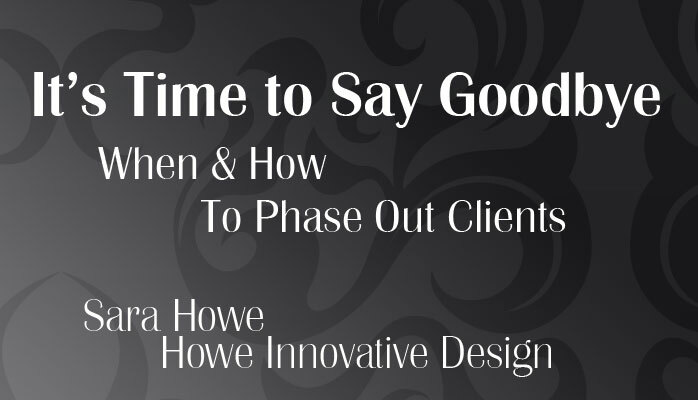 If you know in your gut something isn’t working, it’s time to phase out or cut a client loose. Bad clients don’t make referrals, contribute to burnout and take away from why it is you love doing what you do. Reward the clients and people in your life that you value.